Buying or selling a house is an incredibly overwhelming and emotional event. It's imperative to work with someone you trust and who is willing to guide you through all of the paperwork, logistics and questions. I pride myself in walking my clients through every step of the process so there are as few surprises as possible. Prior to real estate I had a 25 year career in magazine advertising. My sales, promotion and marketing experience and skills have helped me build a successful real estate career working with buyers and sellers all over the Westside. Beautifully appointed townhouse with private entry garage and hardwood floors. This spacious 3 Bedroom/2.5 Bathroom is in a meticulously maintained 10 unit building and includes earthquake insurance. Kitchen has been updated with granite counter tops and has an eating area. Dining Room and kitchen both overlook outdoor patio making alfresco dining a must. All Bedrooms are located on upper level. The 2 car side by side garage offers ample storage space and includes laundry. Other features include 10 feet ceilings, Fireplace in Living Room and Master, Custom Window Coverings, and alarm system. This home is in Franklin Elementary District and walking distance to Montana Avenue shops and restaurants. Spacious 5 Bed/4Ba Trad. Home in Beverlywood HOA. Lrg. LR/DR with Built-Ins and FP. Both LR/Fam Rm overlook spacious and private backyard with pool and lrg. patio. Eat In Bkfst Rm off Kitchen that opens to the family room. Private Master Suite and 2 large bedrooms upstairs. 2 Beds and 1 Bath downstairs. 1 bed could easily be used as home office with separate entrance. Freshly painted inside/out. New carpet and wood floors. Great Location off Circle Park. 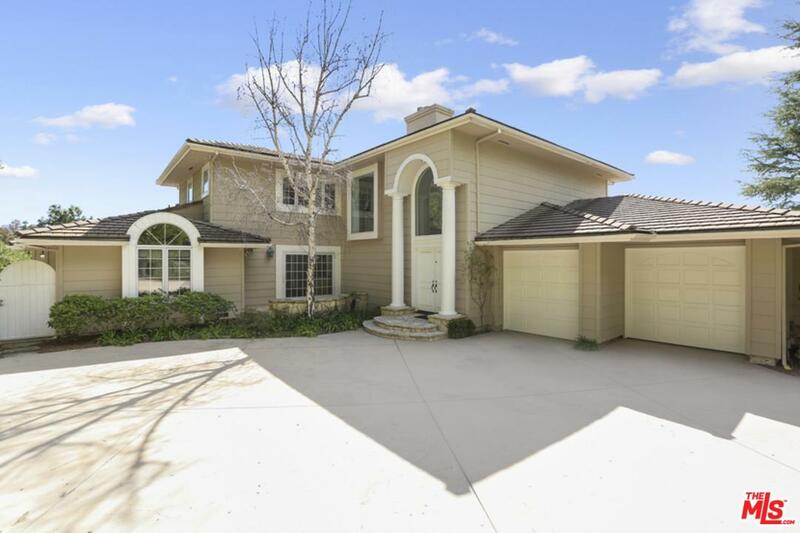 Beautiful traditional 2 story, 5 bed/4.5 bath home located on a highly desirable street in the Beverlywood HOA. Large gourmet kitchen opens to dining room. A redwood deck overlooks the recently-resurfaced pool and patio in a private yard. A recently added bedroom has an en-suite bathroom. Downstairs, a very large game room/family room w/wet bar creates a fabulous entertaining area. In addition, this spacious home has an abundance of storage, plantation shutters, hardwood floors, recessed lighting, separate laundry room, and 3 fireplaces. One of the largest lots on the street, this traditional home offers numerous options. Bring your decorators to update this roomy 2 bed/2 bath with den and separate guest room with a bathroom. Or bring your contractor and start from scratch. Wood floors, crown moulding, lovely room off kitchen, a spacious backyard and lots of light are just a few highlights of this Beverlywood Adjacent gem. The permitted guest room is approximately an additional 465 sq feet. Huge price reduction! Bring your clients quickly. Beautiful Traditional home with ideal floor plan and great location. All 5 bedrooms are located upstairs. 5th bed could be a maid's room with separate staircase. Master Suite has walk in closet. 2 Beds have own bathroom. Remodeled kitchen with butler's pantry and built-ins. Family Room and spacious breakfast room overlook backyard with pool. Formal dining room has wainscoting and crown molding. Large Living Room with fireplace. Office has new carpet, wet bar and plenty of storage. Ample closet space throughout. We interviewed three realtors in the neighborhood and decided to go with Jenny and Lee. Their dedication to service, knowledge of the neighborhood and their marketing strategy set them apart from the competition. Selling our parent’s home was extremely emotional. Jenny and Lee carefully walked us through every step ahead of time. Not only were they extremely professional, but we enjoyed working with them. Jenny and Lee’s extensive and comprehensive marketing strategy allowed us to sell our house in a challenging location near the freeway quickly and above asking. They were attentive, professional and lovely to work with. The real estate business is getting more and more complicated every year. It was refreshing to work with agents with such extensive knowledge of the contract and escrow process. Jenny and Lee wrote an offer on my listing that was accepted. Their offer presentation set them apart from other agents. I would happily work with Jenny and Lee again. Thanks everyone. With keys in hand I can finally breathe. Thanks to all involved. We couldn’t be more excited. I will send a more formal thank you once I come up for air. But in the meantime...THANK YOU! THANK YOU! THANK YOU! THANK YOU! THANK YOU! THANK YOU! Thank you so much for all of your help. You are true and ethical professionals. Blessings to you for a happy, healthy and successful future. \"Jenny and Lee did a terrific job helping me sell my home in Beverlywood. They are competent, honest, and responsive, and are experts in all facets of residential real estate. I recommend them to anyone looking to buy or sell a home. Chuck Lieberman\"